For years, football players, coaches and the parents of young players have been in the dark about which of the many helmets on the market may reduce the risk of concussions. The NFL does not mandate helmet types, while many NFL teams refuse even to reveal which helmets their players wear. The National Operating Committee on Standards for Athletic Equipment, which certifies sports equipment, has been AWOL on the issue of helmets and concussions. There's been no place for the player seeking helmet safety information to turn. Now all that has changed. Researchers at Virginia Tech have produced the first brand-by-brand, model-by-model ranking for the likely concussion resistance of helmets. A star-rating system modeled on crash safety rankings for automobiles, the rankings clearly identify the best and worst helmets. Virginia Tech researchers give high marks to these helmets: the Riddell Speed, Riddell Revolution, Riddell Revolution IQ; the Schutt Ion 4D and Schutt DNA; and the Xenith X1. The Virginia Tech researchers give medium grades to the Schutt Air XP and Schutt Air Advantage. The Virginia Tech rankings warn players not to wear these helmets: the Riddell VSR4 and the Adams A2000. Now the chilling part: the VSR4 -- Virginia Tech's second-lowest-rated helmet -- was the most common helmet in the NFL last season. The VSR4 is widely worn in college and high school, too. Immediately after the Virginia Tech findings were released, Riddell advised football teams to stop using the VSR4, long the company's best seller. Stefan Duma, the Virginia Tech engineer who led the rankings project, says players should be safest in the four- and five-star helmets. "The five-star model was only a tiny bit better than the four-stars, so any five- or four-star helmet is likely to provide the best protection against concussion," Duma says. People's heads have different shapes, and helmets fit them differently -- so a three- or four-star helmet that's right for the shape of your head may be better than a four- or five-star that does not fit properly, he said. In any case, Duma says, "The bottom two helmets are not recommended. Don't wear them." Duma further notes there is no correlation between helmet price and safety. The lowest-ranked helmet, the Adams A2000, costs $200, while the four-star Schutt DNA retails for $170. The DNA looks like the best value on the market -- nearly as good in safety ranking as the top-rated Riddell Speed, but costs about $75 less. This can matter if you're buying 100 helmets for a high school or small college. Virginia Tech's findings pertain to pro, college and prep football. The school has begun to study helmets for youth football, but does not yet have results. There are no apparent conflicts of interest in the Virginia Tech study, since the researchers did not accept any funding from helmet manufacturers, the NFL or the NCAA. Virginia Tech's work -- done by the school's engineering department with support from the football program and its coach, Frank Beamer -- could be the opening act of a new era in which sports equipment is actively designed for injury reduction, while star-rating systems allow athletes and coaches to become smart consumers about what's safest to wear. "A generation ago, automobile manufacturers said that star ranking systems for crash survival could never work," Duma says. "This turned out to be completely wrong. Car star ratings communicate safety to buyers in a clear, simple way. The ratings caused automakers to rethink engineering, with the goal of getting five-star safety. Since the car star ratings began, highway fatalities have declined steadily, even though the population is growing. The result is that driving is today less dangerous than it used to be. My hope is that star ratings for helmet concussion safety will lead to better designs and a decline in concussions, so football becomes less dangerous." Just as some in the automobile establishment were upset when safety star ratings were proposed, some in the football establishment are upset by Duma's work. Some manufactures don't want players to have clear, simple safety information about equipment. Some general managers and athletic directors long have preferred waivers, disclaimers and obfuscation to facing safety questions. Schutt and Xenith are complaining about Virginia Tech's methodology: Though both offer helmets that won four-star ratings, Riddell finished first. That Virginia Tech is upsetting the establishment surely means the school is making an important contribution. CONCUSSIONS HAVE LONG BEEN AN UNSPOKEN PROBLEM in football. A broken leg or torn knee ligament can't be hidden; concussion symptoms usually are not visible, while players have an incentive to deny that their heads hurt, in order to get back into games. Whether the speed and power of the modern game causes more concussions or concussions are simply coming into the light of day as an issue is a subject of debate. In recent years, football concussions have been Issue No. 1 in sports safety. (Issue No. 2 is girls' and women's knees.) As football players began to express concern about concussions, the obvious question arose: Which helmet is best to wear? Even trainers and team physicians had no guidance. Into this picture stepped Duma, who joined the Virginia Tech engineering faculty in 2000. Previously, he had designed impact-absorbing systems for cars and for the Army's Blackhawk helicopter. "Helicopter crashes are similar to car crashes," he says. "They can be survived if the equipment is right." Having attended the University of Tennessee when Peyton Manning was playing there, Duma is a hard-core football buff. He soon realized Blacksburg, Va., is a patch of football heaven. On home game days, Virginia Tech's Lane Stadium becomes the capital of Virginia, if not of the entire mid-Atlantic region. The program does not dominate college sports news, because the Hokies have never won a national championship. But Virginia Tech football has posted seven consecutive seasons of 10 wins or more -- something Alabama, Michigan, USC and other glamour programs cannot say -- and 18 consecutive bowl seasons, a dazzling number. Beamer is insufficiently appreciated on the national stage. Not only is he the second-winningest active Division I football coach, trailing only Joe Paterno, 20 years his senior: Beamer shows the old-fashioned virtue of staying true to his school. He's been at Virginia Tech since 1987, spurning offers for more pay elsewhere. Beamer's program posts strong graduation rates both for football players generally, and for African-American players -- making the Virginia Tech brand of football the kind that a person can enjoy unreservedly, because the players are receiving educations. Landing a good job at a major research-center university with a rising reputation and fabulous football, Duma was a happy man. But from knowing what happens to the human brain in a car or helicopter crash, he knew that what happens in a football helmet-to-helmet collision can't be pretty. Virginia Tech researchers led by Duma approached the football team about placing tiny accelerometers into helmets. (This has been tried at several football programs over the past decade, and may be tried in the NFL soon.) The results were disturbing: The most violent collisions can subject the brain to about 120 times the force of gravity. "Routine" hits equate to 20 to 40 times the force of gravity. "When we first put the accelerometers into helmets, players would come to me after practice asking, 'How high did I get?'" says Mike Goforth, director of athletic training at the school. "They wanted to see a high 'G' number to show they were hitting hard. But once we had data, we took it very seriously. Now we monitor hit intensity and if a player sustains a high-impact head hit, his number lights up on the team physician's pager and he is checked immediately. Concussions are a big concern -- we're seeing them in many sports, including cheer. A lot of major college programs don't want to know, they would rather pretend this is not happening. At Virginia Tech we want to be a leader institution, out front in trying to fix the problem." Duma realized that because football helmets were not ranked -- or even tested -- for concussion resistance, players and coaches had no idea what was best. Before star rankings for car safety, there were urban legends about which cars were safer in a crash, but no hard numbers. Duma wanted hard numbers, and envisioned a project to test helmets for concussion resistance. Duma went on to help found what is now a Virginia Tech-Wake Forest injury study project. He reached full professor status in just six years -- blazing speed in academia -- while winning awards for research into car safety and military helmets. Duma put together funding support from the National Institutes of Health, the automaker Toyota and the U.S. Army, which hoped data from football headgear could improve the safety of combat helmets. (You may have seen Toyota's ads about the companion research at Wake Forest, which concerns the kinds of head trauma common to auto crashes and sports.) In order to ensure that no interest group could influence the results, Duma turned down funding from anyone with a monetary stake in football. Promptly, Duma ran into resistance from the National Operating Committee on Standards for Athletic Equipment, an independent organization which was supposed to be doing the job that Duma proposed to do. IN THE 1960S, FOOTBALL HELMETS WERE SHODDY, resulting in deaths from skull fractures. NOCSAE (pronounced "noxey") was founded in response, and pressured helmet manufacturers to improve quality. The initiative was a success: Skull fractures in football are now extremely rare. But though NOCSAE would go on to issue standards as precise as nine pages of guidelines on how to stitch football gloves, decades after its founding, the organization has said almost nothing about the relationship between football helmets and concussions. About the time Duma was arriving at Virginia Tech, Riddell introduced the Revolution model, the first football helmet designed for concussion resistance. Word spread in football circles that the Revo, as players dubbed it, did a better job than traditional models, such as Riddell's VSR4, the most common helmet. That advanced helmets were safer was not some hidden secret. James Collins, then head football coach at my kids' high school, staged a fundraiser in 2004 to junk the school's VSR4s and replace them with Revos. Soon Schutt also introduced advanced-model helmets, and Xenith, a start-up founded to make concussion-resistant headgear, entered the market. Yet the NFL took no action, saying that what helmet model a player chose was up to him. When, in 2006, I asked NFL spokesperson Greg Aiello why the league wouldn't issue safety standards for helmets, he replied that the NFL was waiting for NOCSAE to make a recommendation. The wait continues -- five years later, NOCSAE still hasn't said anything. During the 2010 season, Ben Roethlisberger and Aaron Rodgers, who would eventually become the Super Bowl starting quarterbacks, sustained concussions wearing the outdated VSR4. This means NFL stars of 2010 were wearing helmets inferior to ones the players at my kids' high school have used since 2004! When they returned to action, both players switched to improved helmets made by Schutt. Am I unsafe if I don't wear one of the top-performing helmets? No. All of the helmets tested have been certified by NOCSAE. As Aiello explained in 2006, an NFL player may wear any helmet that receives the NOCSAE seal of certification. Here's the rub: All helmets receive the NOCSAE seal. LET'S PAUSE HERE FOR SOME POINTS OF CAUTION. Most important is that no helmet can prevent concussions: What advanced helmets do is lower the risk. There is considerable chance involved in head injuries, as in all injuries. A player wearing the obsolete VSR4 might go years without problems, while a player donning the very latest model might immediately sustain a concussion. The NFL's data, and this study conducted at the University of Pittsburgh, suggest that advanced helmets -- basically the ones Virginia Tech found to be four- or five-star -- lower the risk of concussion by about one-third. A one-third drop in concussion risk is significant. This paper estimates that in recent years, over the course of a season, roughly one NFL player in 20 sustains a concussion. If that rate projects across college and high school football -- it may not; there is no research consensus on this point -- then playing football could cause 40,000 to 50,000 concussions per year. Dropping the figure by one-third would be welcome news. The next qualifier is that concussions are poorly understood. Like most concussion research, the Virginia Tech study focuses on linear impact: direct helmet-to-helmet contact. But some neurologists think rotational impact -- the glancing blow that twists the head -- is just as dangerous. Some research suggests that big hits aren't the main concussion cause: many concussions result from the accumulated damage of lots of minor hits. There's a line of thought that double-sided and/or Type III mouthguards -- fitted to the individual -- reduce concussions. (The New England Patriots wear Type III mouthguards; most football players still use 1950s-style "boil and bite" mouthguards.) Some trainers believe strengthening the neck muscles reduces concussion risk, yet few football conditioning programs do much for the neck. Helmets that are too loose are a factor in concussions. "When you see a player's helmet go flying off during a hit, that means the helmet was improperly fitted," Grant Teaff, head of the America Football Coaches Association, said at a recent seminar of the National Sports Concussion Cooperative, a new organization. Football helmets are supposed to fit tightly: The reason there are holes in the flaps is that you're supposed to have to pull outward to get the helmet off. Watch the sidelines of NFL and NCAA games -- players are popping off helmets as easily as if they were baseball caps. Many football players don't know that a snug helmet reduces concussion risk, and coaches and equipment managers don't seem to be telling them. And there's broad agreement that coaching reforms and stricter officiating will do more to reduce concussion incidence than any type of headgear. "The best results for concussion reduction will come from changing football behavior," says Kevin Guskiewicz, a professor of sport science at the University of North Carolina and head of the NFL's helmet research. Coaches need to emphasize "see what you hit" -- head-up hits are much less dangerous than head-down hits. Television commentators need to stop praising helmet-to-helmet contact -- all networks, including ESPN, are guilty of treating vicious hits as highlights, while saying nothing about the dangers of helmet-to-helmet contact. Guskiewicz writes to CBS, ESPN, Fox and NBC to complain when football announcers praise dangerous behavior, thus encouraging young players to lead with their helmets. (He objected strongly to ESPN's "Jacked Up" segment, since discontinued.) Officials at all levels of football should throw the flag for unnecessary roughness more often than they do, and eject players from games for helmet-to-helmet hits. If the NFL were to make ejection for helmet-to-helmet hits an officiating "point of emphasis," player behavior would change fast. Improved equipment is just one aspect of addressing the concussion crisis. Now back to helmets, Virginia Tech and NOCSAE. NOCSAE TESTS HELMETS based on a "severity index" of what happens in a linear impact. To receive the NOCSAE seal, a helmet must score no more than 1200 on the index. 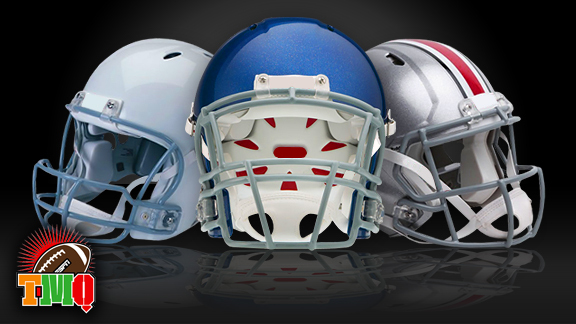 All helmets on the market in the past decade have passed the NOCSAE test. "Because every helmet always passes the NOCSAE test, in effect that test says nothing," Duma maintains. "An Adams at a severity index of 1150 and a Riddell Speed at an index of 400 offer vastly different protection. But to the NOCSAE seal system, they're the same. NOCSAE ranks all helmets as equal, and that is just not true." NOCSAE has sponsored studies of football concussions, but never come to any conclusion regarding helmets. The organization is very unhappy about the Virginia Tech study, which is widely perceived as bringing into the light information that NOCSAE has dragged its feet on. Here, NOCSAE takes a shot at Virginia Tech, saying "we caution against" its star rankings, then adding "NOCSAE urges parents of athletes and athletes to get all the facts about football helmets and concussion protection." How to get the facts? According to NOCSAE, the way to do that is to read "hang tags that come with all new football helmets that address the helmet's abilities and limitations." At a recent National Sports Concussion Cooperative seminar at the University of North Carolina, Michael Oliver, director of NOCSAE, spoke for 15 minutes about why his organization is silent on helmets and concussions. NOCSAE's founding mission statement calls for reform "where feasible," Oliver said, and concussion reform may not be feasible. Until there may be "scientific certainty" about the exact causes of football concussions, it would be "unethical" for NOCSAE to offer guidance, Oliver maintained. This is the opposite of the view taken by Virginia Tech researchers. "There will never be perfect information, but we know enough to do something today," Duma says. He notes that many kinds of safety advances that were initially controversial, and are now considered great ideas -- seat belts and air bags, warnings about cigarettes and cancer -- were put in motion long before scientific certainty. If it was unethical to offer guidance absent scientific certainty, the National Institutes for Health, American Medical Association and the Centers for Disease Control would rarely say anything. At the seminar, Oliver declared of NOCSAE, "All our income is from sports equipment manufacturers, as licensing fees for putting the NOCSAE logo on their equipment." This represents a serious conflict of interest. If the organization called any helmet unsafe, the manufacturer could no longer use the NOCSAE seal, and might stop paying NOCSAE the licensing fee. This would seem to give NOCSAE a financial incentive to reach no conclusion about helmets and concussion safety. NOCSAE also sells its seal to helmet reconditioners, who market many helmets used in prep and youth football. The trade association of helmet reconditioners has a seat on the NOCSAE board of directors. Reconditioners buy old helmets -- usually helmets that lack advanced features -- spruce them up, then resell them to high schools and youth leagues. If NOCSAE issued concussion standards for helmets, nothing manufactured before roughly five years ago would be considered safe. The reconditioners would lose business -- and would stop buying the NOCSAE seal. The Virginia Tech research, by contrast, is funded by third parties with no financial stake in the outcome. Virginia Tech's motives are above reproach, while NOCSAE's motives are open to question. WHY HAVEN'T MOST FOOTBALL PLAYERS DEMANDED safer helmets? Many feel invincible, or are fatalistic: "If a concussion is going to happen, it will happen regardless of what I wear." Some coaches discourage players from talking about concussion symptoms, or tell players that going back on the field with a concussion proves you're a man. At the high school level, players are so desperate to be on the team that they'd play with crumpled-up tin foil on their heads if that's what the coach said to do. But the main reason football players often don't seek safer headgear is that until now, they had no clear, simple way of judging which helmets might protect them best. Will a stampede to safer helmets begin? The irony is that even as helmet manufacturers complain about the Virginia Tech ratings, the rankings may spur sales. At public high schools, the issue may be cost. Old reconditioned helmets sell for $50 to $75; the helmets that did well in the Virginia Tech study cost $170 to $260. Most colleges can handle the cost, and there's no doubt any college can insist that players wear the safest helmets. Because the Virginia Tech rankings now make clear which helmets are suspect, school districts and colleges may fear legal consequences if they issue players helmets ranked as not recommended. If the NFL mandated that players only wear advanced helmets, a strong signal would be sent to the college and high school ranks. Guskiewicz, who runs the NFL's helmet study, has two sons playing football, and last fall, at his insistence, both wore the four-star Xenith. But though that is what the league's expert puts on the heads of his own, Guskiewicz says there are no plans for the NFL to require use of the models that do well in safety ratings. "Do you take a player who's worn a certain helmet for years without problems and tell him he must wear a different helmet?" Guskiewicz asks. "He was fine in Helmet A. You tell him to wear Helmet B because you think that helmet is safer, then he gets hurt. Are you to blame?" In a recent conference call with Pittsburgh Steelers season-ticket holders, NFL commissioner Roger Goodell was asked why the league does not mandate the helmets that its own research shows are best. His reply was remarkably similar: "The fact of the matter is that several players who have been playing with a specific helmet since college years or even high school years and have not had any issues may feel very comfortable in their helmet, and if we tell them they have to wear a different helmet, that creates liability and other issues." The belief that trying to act regarding helmet safety would only create liability for the NFL seems deeply seated in the league's thinking. Many league and club officials appear to believe that liability law says: As long as you wash your hands, you're not responsible; but if you give advice and then something happens, you're liable. This may be an inaccurate reading of tort law. Most liability is based on a concept called "asymmetrical information." This doctrine holds that if you know about a danger and don't disclose that information, you may be liable for harm; but if you disclose everything, you're not likely to be liable. So if the NFL said, "You must wear one of the highest rated helmets because we reasonably believe this will reduce overall harm to players, but beware you are still in danger of getting a concussion," chances are the league would be in a strong position in any future tort case. But there's no guarantee -- juries can be unpredictable. Lawyers try to steer their clients away from legal complications, and it appears the league's lawyers have told the NFL not to mandate helmets, in order to minimize legal risk. The result? More concussions for players, but less potential liability exposure for NFL owners and a bad example set for the 1 million boys who play high school football. Honk if you think that's pretty cynical. VIRGINIA TECH'S RESEARCH IS HARDLY all that's going on. The NFL is studying concussion incidence by position and by type of play, trying to determine if some aspects of the game lead to more neurological risk than others. Such research may find that defensive backs and wide receivers -- who often collide at full speed -- are most likely to sustain concussions, while kick-return plays are most dangerous overall. This past winter, the NFL Competition Committee debated new rules that would make touchbacks more likely, reducing the number of kick returns. No changes were enacted, but this proposal may come up again -- or the NCAA or National Federation of High Schools may change kicking rules at the college and prep levels. There is also a growing debate about whether the three-point stance should be abolished. This would prevent the multiple heads-down collisions that begin line play. As recently as 2009, only Oregon had a law requiring concussed high school players to leave games and not resume contact until cleared by a neurologist. This winter, such laws proliferated rapidly -- see the National Conference of State Legislatures chart of states that either already have laws on high school sports-related concussions or soon will. The proliferation of such laws, combined with the NFHS making concussion care its officiating "point of emphasis" for the upcoming 2011 season, should improve safety for high school players. Most of the college football conferences are discussing uniform reporting for head injuries; the NFL is doing the same. Uniform reporting would help clarify whether concussions themselves are up, or whether better diagnosis is causing higher numbers as this problem is put under the spotlight. Uniform reporting might show that particular teams were experiencing significantly more concussions than the norm -- then the team's style of play, and of practice, could be examined. Reforming practice, for example by eliminating the nutcracker drill in which two players deliberately knock helmets until one gives up, would be a positive step. (Neurologists and trainers are aghast at the nutcracker drill, but unlike games, football practices are almost entirely unregulated.) Uniform reporting standards also would ensure that the conscientious coach who removes any player with concussion symptoms is not at a competitive advantage to the bloodthirsty coach who sends a concussed player back into the game. LAST SEASON, THE VIRGINIA TECH HOKIES wore the Riddell VSR4 -- the very helmet Stefan Duma's research found unsafe. For the 2011 season, Virginia Tech will wear the top-rated Riddell Revo or Speed models, with each player choosing whichever better fits the quirks of his head shape. Considering the Hokies have four helmet color combinations and dress 72 for games, that's a truckload of new helmets. "My equipment manager has wanted to get rid of the VSR4 for years," says Goforth, the Virginia Tech trainer. "He has long believed the new designs are safer. Finally, he has research to back him up." If Duma's star rankings trigger a switch to advanced helmets at all levels of the sport, and if his research is right, concussion incidence should stabilize, then begin to decline. Everyone who loves football should want this outcome -- not only for the health of players but for the long-term standing of the game. Root for the Hokies in the fall: By putting safety first, they are setting the example football needs. In addition to writing Tuesday Morning Quarterback for Page 2, Gregg Easterbrook is the author of the new book "Sonic Boom" and six other books. He is also a contributing editor for The New Republic, The Atlantic Monthly and The Washington Monthly. His website can be found here.